Look, we get it. Sometimes you genuinely want to binge-watch a show with a new buddy, and that’s totally cool. 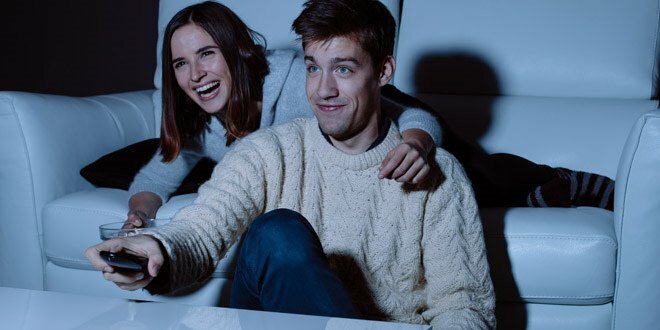 However, inviting someone you’re interested in to come over to ‘hang out and watch something’ is a move as old as cable television – so while you might be rolling your eyes at the so-five-years-ago slang, there’s good reason to want to be able to pull off a flawless Netflix and chill. And why not? It’s low-pressure, you get to preview behavior that could make or break a relationship down the line (confession: we are TV talkers and we can’t stop/won’t stop) and if a hook up doesn’t happen, at least you got to hang out and watch your favorite show. But how can you make sure you pull off the perfect night of Netflix and chill? Ever noticed how it’s super easy to say almost anything to a friend, but as soon as you have a thing for someone, the simplest question requires analysis of five different phrasings and possible answers, with input from at least three of your BFFs? Keep it simple. Either start a conversation about a certain series that’s had a lot of buzz, or a more obscure old favorite you both like, and suggest they come by for a watch some night. It doesn’t need to be anything fancy, but showing genuine enthusiasm for the program of choice makes it come off a lot less skeevy – and a lot less like you want to see them but can’t be bothered to make the effort of a proper date. Depending on how well you already know someone (and how hospitable your living space is) you may go opt for a bedroom-viewing, but the living room is a much safer bet for making sure everyone is comfortable. If you have roommates, give them a heads up that you’re having a friend over, and that the entertainment for the evening is not going to be PG. If you’re taking up a shared space, give them decent notice and bribe them with pizza if you’re going to sexile them for the evening. Obviously you can’t invite someone over to a messy house (we think your momma taught you better than that) but if you go all out it might make you look like American Psycho. Bathroom ought to be immaculate, and if you’re a gentleman having a lady over, that includes having a garbage can in it. If you don’t know why, then we think you might not be ready for adult relationships. The rest of the house can be clean and tidy, but don’t break a sweat over making sure your DVDs are alphabetized and dusted if that’s not the norm for you. Oh, and it should go without saying that your bedroom (and sheets) gets cleaned with the expectation that things might migrate there from the couch. A good host has something on offer, so you’ll need to establish beforehand whether you’ll be eating during the evening. If you are ordering in, it’s fine to split the bill, but if it’s your house, you should be prepared to treat. Establishing whether you’ll be dining vs snacking beforehand is also a good way to figure out if you should be stocking your fridge with beer, wine or soda (a great host has all three). You may also want tos how off by having their favourite on hand, but keep in mind that any snack that can be categorized as ‘dangerously cheesy’ is probably not a good call. If the rapport is good and you’ve got the skills to impress, you can try a cooking date, but a) only if you’re actually going to do it together, because nothing can be more awkward for the other person than having nothing to do while you putter around and b) if they know they’re going to be helping out, because not everyone comes over to a hook up with the intention of cooking. Ah, the delicate dance of what to watch. If you’ve both professed a love for Firefly then it should be a no brainer to put on something you both already like but also have seen before. If you’re choosing on the fly, you should defer to their choice but have a few back ups already chosen (light, enjoyable, but also not distracting when things get hot and heavy, and ideally something with a lot of loud action scenes if you have a roommate). Yea, that’s 100% going to happen, but there’s nothing you can do about it. Unfortunately, there is no algorithm for calculating the exact right time to make a move, so you’ll just have to feel it out. Sticking your tongue in someone’s mouth the second the opening credits finish might work in some situations, but is not exactly a safe bet. Waiting until part way into the evening means you’ve had time for a connection and sexual tension to grow, and that if the other person is not feeling it – because establishing consent is not optional – there’s less time spent in awkward silence until the program is over. While ‘Netflix and chill’ has become shorthand for hooking up, at the end of the day it’s really about hanging out casually, with the possibility of some make outs or more. Use the time to connect over common interest, and treat any action as a great bonus rather than something you expect. The post 6 Steps for Pulling off the Perfect Night of Netflix & Chill appeared first on Volonté.